'25 hour Cargo Piece' (detail) by William Villalongo. Images courtesy Susan Inglett Gallery. William Villalongo A'99, assistant professor in the School of Art, has a new solo exhibition titled "Keep on Pushing" installed at Susan Inglett Gallery (522 West 24th Street). His fifth solo show at the gallery, it has been included in must-see lists in both Paper magazine and Artnet. "I've been using the figure to tell a story about historical erasure," Villalongo says about the theme that has run through his exhibitions at the gallery. "The works in 'Keep on Pushing' focus on the black male figure." The figures in question are semi-abstract. While environmental objects, pieces of clothing, as well as hands and eyes and some other extremities are clearly readable, the rest of the person appears as a collection of marks with references to leaves, twigs and brambles. The gallery writes in its press release, "Much like fallen autumn leaves, Villalongo’s men navigate their world, subject to an unpredictable wind - piling, spinning, and re-collecting." Most, if not all the works, use black velour paper or black velvet flocking as the surface material. The shapes that form the figures are, in the case of the paper works, cut by hand with an X-Acto knife. He lays this on top of a white backing material and paints the other elements or adds collaged images. "I wanted to deal with black as a material and a space," the artist says. "It's velvet-coated paper so it's the blackest thing I could find." The cuttings share a grammar but each one is individually created. "I suppose I probably repeat myself sometimes, but I don't think it's ever an exact replica." 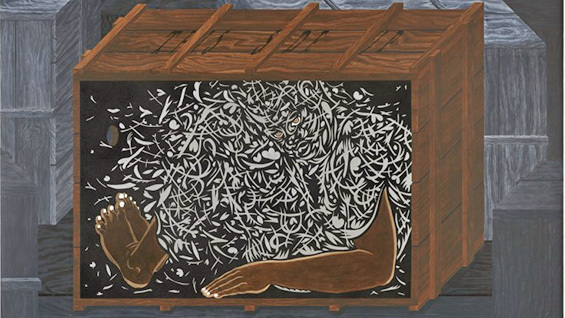 In spite of being semi-abstract, all the figures are contextualized as being part of our contemporary world, often with an explicit or implied commentary on the role of African-Americans in today's culture. (The works are all from 2017.) 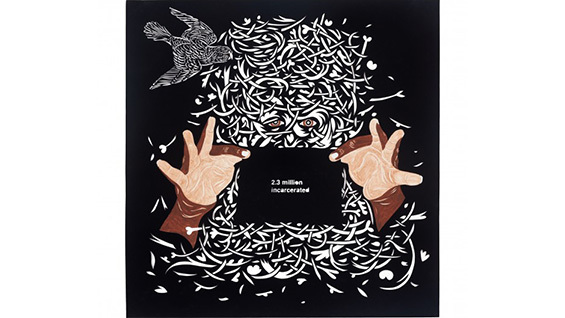 "Free, Black and All American" is a triptych of three equally-sized cut-paper works. In each one, a pair of hands holds up a card below a pair of eyes, forming a kind of face out of the signature bramble-marks. Each card has text that reads, "13%," "250 yrs slave/152 yrs free," and "2.3 million/incarcerated," respectively. In another work, entitled "25 hour Cargo Piece" a figure is scrunched up inside a cut-away of a cargo box. The eyes engage with the viewer, a haunting evocation of the plight of refugees, immigrants, and even torture victims. Not every piece has an overt political overtone, though. "Flex" shows a dancer, perhaps, with his arms outstretched behind him, coiled around each other. 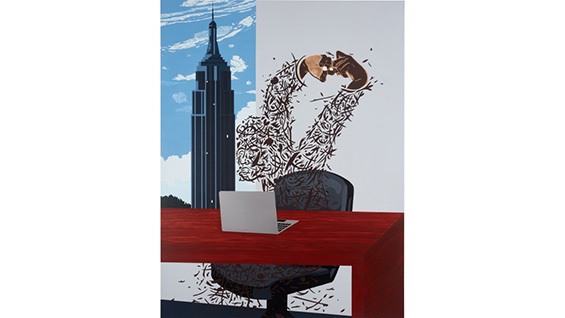 "Corner Office" has a figure in a similar pose, but seated behind a laptop with the Empire State Building visible through a window. The gallery describes the works together as conjuring, "spaces of sensuality, humor, and history. Titled after Curtis Mayfield’s 1970 'Keep on Pushing,' Villalongo’s recent body of work speaks to the inherent human spirit’s will to persevere and to find a way."